For those hunters planning on going after gobblers in Oregon or other states, I reviewed a number of products for the upcoming season which may be of interest to you. Here are some I've added to my gear for this season. Coaxing a gobbler from the roost or strutting ground is what I hope do with the sounds of two diaphragm calls and the new Pocket Puppy scratch call from Knight and Hale. Quaker Boys Screamin' Green Lightnin' and Screamin' Green Hecklin' Hen diaphragms will provide the durable, yet seductive voice which should entice the toms to the decoys. In other situations, I plan to use the smaller "shirt-pocket size" version of Knight and Hales Sla-Tek topped all-weather "Old Yeller" to bring the gobbler from roost and onto the path of destruction. All three calls tested successfully and may be something you may wish to investigate. I'm planning on putting the "finishing touch" on a mornings work with the aid of the super-lifelike appearance of Buck Wing Products' Hen and Jake decoys. In the field, these decoys have the most realistic appearance, at any angle, of any turkey decoy I have found. The snake-like dull appearance of the hens neck and head are as fitting to her gender as the gaudy, intricately painted snood and caruncles of the jake are to his. Both of these decoys have a bit of iridescent shine to them, which lends more realism to their fakery. Buckwing has an improved model of its decoy expander. The permanently attached, umbrella-style expandable mounting stake will quickly pop open any flexible turkey decoy. Their height adjustment not only allows the hunter to raise the height of the decoy into view as spring grass grows, it also limits the turn of the decoy and prevents the "windmill effect" that can blow an entire morning hunt with a single errant breeze! 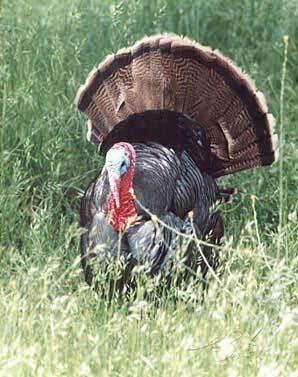 Oregons spring turkey season begins on April 15th and will run through the end of May. Daily bag limit will be one male turkey "with visible beard." The legal limit for spring turkey taken under general tags is two. However, a bonus turkey tag is available for Coos, Douglas, Curry, and Josephine counties. Additionally, the bonus tag is legal in Jackson County north of Highway 66, east of Jenny Creek. Shotguns of 10 gauge and smaller may be used. All shot between BB and size 6 is legal. Recurve, long and compound bows may also be used to take wild turkeys. Shooting hours are from 1/2 hour prior to sunrise, to sunset.